Built to save you money! NOTE: Footprint of 12' buildings are approximately 6 inches less than stated width. All dimensions are approximate! Information subject to change without notice. Are you interested in saving money? If you would like to save money, when would be the best time to start? The all new Value Shed is designed and built to save you money! The 40 year metal on the walls and roof is sure to give you the protection you need against the weather's fury! The floor is designed to stand up to the test of daily use and with our concrete blocks that we set the building on, our Value Shed has the strongest floor in its class! The spacious 4' door comes standard and includes a secure locking knob set with 2 keys!​ The 5' door upgrade is also available for only $50. You will enjoy the 1 year workmanship warranty that covers your new Value Shed. The Value Shed comes standard with Light Stone walls, and Polar White roof. You can choose any of our four trim colors. If you would like to have a different color, we would be happy to accomodate your Custom Color needs for only $50. Click here to see a list of available custom colors! The Value Shed is not guaranteed mouse proof. 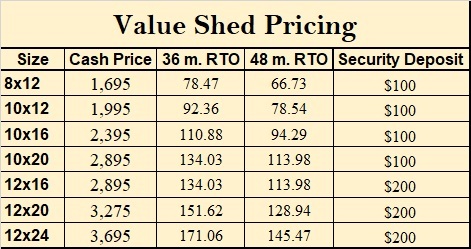 Order your Value Shed today! The initial payment for Rent to Own is the first payment plus the security deposit.